On roadtrips we make it a mission NOT to eat in chain restaurants. That’s sometimes easier said than done when the road sides are adorned with signs indicating hundreds of McDonald’s, Chick-Fil-As and other such fast-food stuff and nonsense. 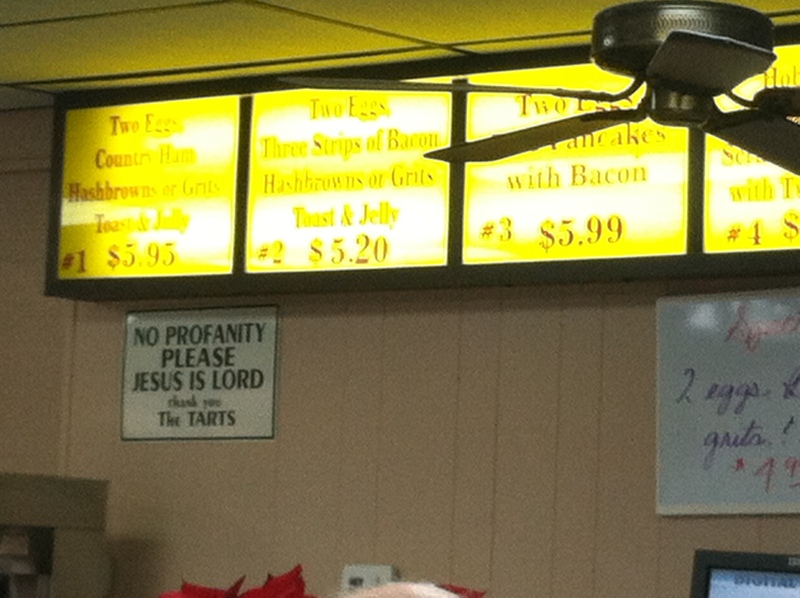 This restaurant showed us a particular brand of Southern Charm – that is, ham and eggs and large lashings of coffee served by Pat and ‘The Tarts’, who were sweeter and friendlier than you can imagine, and they sure don’t like anyone to swear when they’re eating their brekkie. Plus they had mountains of hairspray on, and I was waiting to see if their heads caught fire when they went into the kitchens. They didn’t. Pat did tell us that she found people from the North very rude, when we told her we were living near Baltimore. ‘They just ain’t polite like us Southerners,’ she declared. So beware, Notherners, you might not get such a sweet dollop of Southern Charm if you visit Pat…. We cannot get our heads, or mouths, round grits. They are unappealing dollops of coarsely ground corn kernels boiled with water or milk. My husband has determined that they are only palatable if eaten with maple syrup, bacon and butter. Oh my. Grits, you will not be making an appearance on our British menu back in the UK. We’ve tried ’em, and they can stay in the USA! Next up: the Dixie Confederate Store, Cafe Risque and passing through some reality….. 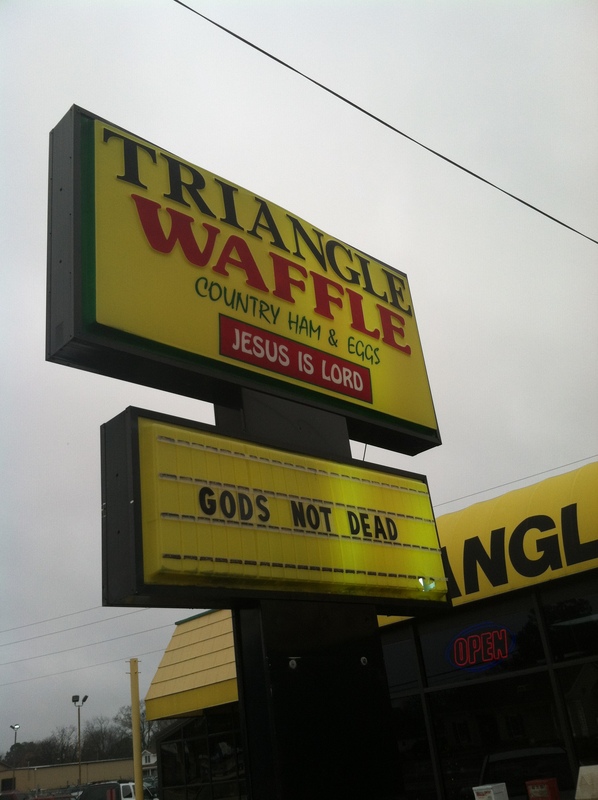 This entry was posted in Travel and tagged America, American, Americans, British, chain restaurants, easy over eggs, expat, food, grits, ham and eggs, Nothern America, Pulp Fiction, roadtrip, South Carolina, southern charm, sunnyside up, Travel, Triangle Waffle, UK, USA. Bookmark the permalink. My first job took me down south often. 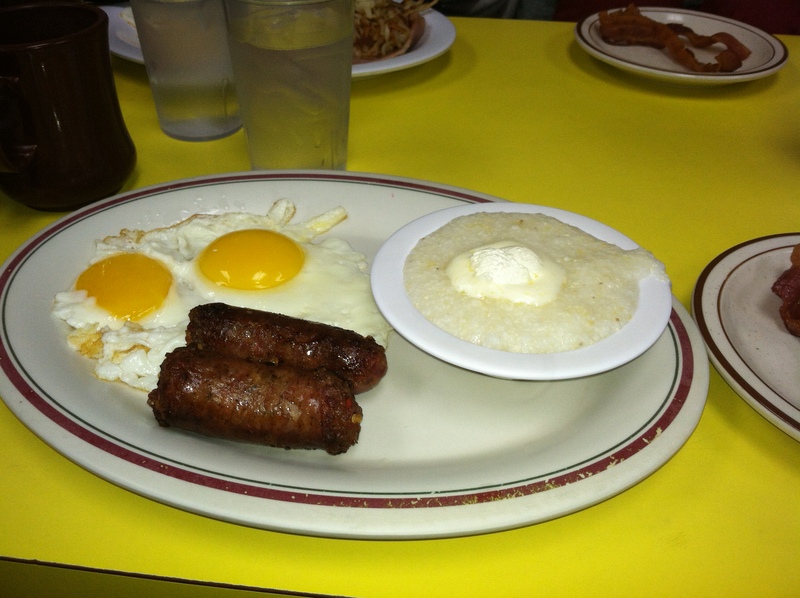 Breakfast always included grits – they never asked. I tried every addition possible – sugar, honey, butter and salt, anything – and I still couldn’t understand why anyone made a second batch of them, ever. We always no we have arrived in the “old confederate states” when we start to see the Waffle House signs at every exit. Also I never met anyone who wasn’t from the South who could understand grits either.